Evadav.com - frequency question and answer. How monetize traffic by Evadav. Register your account at evadav.com, fill up your balance with any payment method you prefer from the variety of supported ones, then set up campaigns and start advertising. What type of advertising does your platform offer? EvaDav is providing advertising services in the format of Push Notifications, which can be displayed to the end user on both mobile and desktop. How do I start the campaign? Which creatives can I use? How long should I wait for the moderation to be completed? The number of ad campaigns that you can create in unlimited. Which GEOs can I target? On our platform, you can target any Geo you’d like to run your ad campaigns in. What sizes of creatives do I need? The icon (small image) should be 192x192 pixels, the large image (creative) should be 492x328 pixels. What is the minimum balance recharge amount? The amount of the minimum recharge is 100 USD. Can I transfer funds from the publisher to an advertiser’s balance? Yes. To do this, you need to contact your personal manager and tell how much you want to transfer. After this, the manager will let you know as soon as the funds are transferred. The campaigns with one of my creatives was rejected. Why did that happen? Why does the number of clicks keeps increasing after the campaign is stopped? This happens due to the mechanics of sending push notifications. Example - sending a new round of push notifications can occur at the moment when your balance is approaching zero point. The system stops further sending, but those notifications that have already been sent out - can be viewed much later than the moment of sending (for example, if the user receives notifications to the home computer, or for some reason forgot the phone), and in this case, can click on the ad creative much later than the average user group. How does technical support work in your company? Are there any blacklists? Can I work with them? You can create an audience that you want to exclude and then add it to the blacklist when creating a campaign. To do this, you need to go to the "Audiences" menu item, create an audience with an arbitrary name (screenshot) and enter the sources of traffic that you want to exclude in the Source field. When creating an advertising campaign, there is a Blacklist section at the bottom, in the Audiences field, enter the first 3 symbols of the audience name and select those you want to exclude from the list. Which payment systems can I use to recharge my balance? and other payment systems available in all parts of the globe. After this, you will be transferred to the page of the payment system to pay the specified amount. I want to send your traffic on my landing page with another push notifications subscription widget. Can I do that? No, this action is prohibited. What is the User impression limit (per day)? This parameter indicates the number of ad impressions that you want to show to one unique user. Which payment model do you work with? We work by the CPC model only. What metrics do I see in my statistics and what do they mean? Date - the date for which statistics are shown. Impressions - the number of ad impressions. Clicks - the number of clicks on advertising campaign creatives. Cost per Click - the cost of one click on the creative campaign. CTR - click-through rate, the ratio of the number of clicks on the advertising creative to the number of Impressions, shows of advertising creative. Total Cost is a value indicating the total spend on the campaign / campaigns in the selected statistics slice. How can I identify sources of traffic that I like or work well with on my campaign? How is the bid win chance calculated? Is it based on the bid price only? No, bid win chance depends not only on the bid price - it is equal to the bid price multiplied by the CTR value and then multiplied by 100. Therefore, a creative with higher CTR will be shown even if their bid price is equal. Which Macros do you support? How to create a stream? 1. In your account, go to the menu section "Streams"
3. Fill in the "Stream name" field and click "Create"
How to add Widget to monetize traffic in Native format? 1. In your account, go to the menu item "Streams"
3. Click on "Create Widgets"
How to add code to install Native Widget to your site? 3. Download JS file to the root directory of your site. How to add a widget in the Popup format? 3. Click on "Create Widget"
How to add code to install Popup Widget to my site? What types of traffic do you accept? We accept almost any type of traffic from all GEOs. But your website must adhere to our rules. Is there a minimum number of visitors that my website should have? We do not have minimum requirements. Whether your website receives 100 visitors a day or 1 000 000, you can register and use our system. What's the average delay of EvaDav statistics? Statistics are updated every 15 minutes. What OS and browsers are supported in EvaDav? Browsers: Google Chrome, Opera, Yandex, Mozilla. If I do not have a website, but there is traffic from exchanges, can I earn with EvaDav? Yes, certainly. The system has Direct Link, to which you can send traffic from the exchange. Are your landings adaptive to the user's language? Yes, all types of landings are adaptive to the user's language. Will work with you influence the position of the website in the search engines? When using our service, there is no impact on user experience with the search engines. Trafficback URL - how does it work? You can redirect a visitor to another link after a successful subscription to receive push notifications. To do this, fill in the field Trafficback URL (redirection point). A postback URL in Attribution Analytics is a URL request to a third-party system that notifies them of a conversion. What is the “Back button disable”? Ability to turn off for mobile traffic return to the previous page by clicking the back button. Complexity is a parameter that regulates the amount of reopening a window to a Push Subscription. For example, if you specified a difficulty level of 20, then the user will need to cancel the subscription 20 times, so that the subscription request is no longer received, or subscribe. If the user subscribes, the subscription window will no longer appear. By default, the difficulty level is set to 100. Set the difficulty level to 0 for unlimited amounts of reopening a window on canceling the subscription (until user close opened window) or change the number to “1” so your visitors get to see the pop-up banner only once. You can change this number at any time. Earnings depend on the website performance and market conditions. The geographic location of your website traffic can also play a significant part in determining your potential revenue. What is the minimum amount of earnings available to withdraw funds? We have a minimum payment threshold of $25 and billing is handled automatically. The payments are made every 7 days on Mondays. 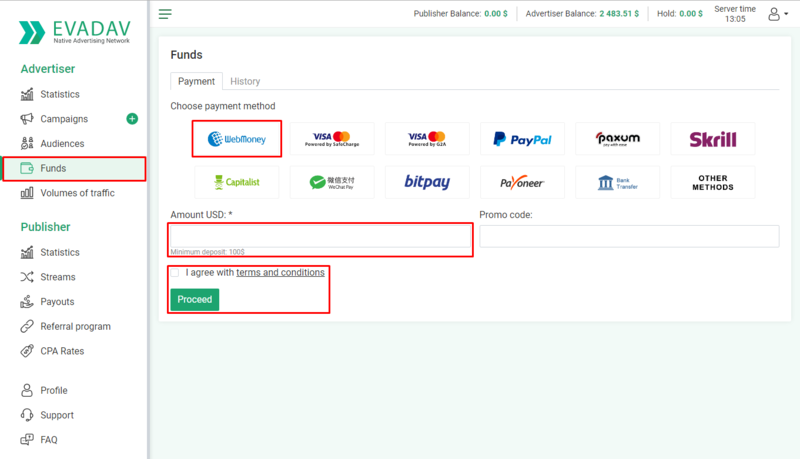 Currently, we offer PayPal, Paxum, Skrill, Payoneer, ePayments, Webmoney and SWIFT as payment methods. The minimum amount for withdrawal is $25 and $500 for SWIFT. Is there a fee for making payments? You get exactly as much as you earned in the system. EvaDav always shows the best paying ads on your website. Our AdNetwork is an intelligent and fully automatic system, which finds ads with the best CPM and shows them by OpenRTB. My site has international traffic, can I join? Yes. We accept Non-English sites. Any GEO can be monetized. Evadav.com allows publishers to monetize their websites or landing pages through advertising with push notifications. Visitors subscribe to receive push-notifications from your site or our landing and such subscriber will constantly bring you revenue by viewing and clicking on the push notification ads. What types of monetization does EvaDav offer? EvaDav offers two types of monetization - a Native format and a Popup widget. In case of any other questions, please, do not hesitate to Contact Us.